Abbas' Presidential Guard: "Water freedom with blood of Palestine`s sons"
"watering freedom with the blood of Palestine's sons"
Palestinian leaders have portrayed the last few weeks of Palestinian riots and protests against Israel's enhanced security measures at the Temple Mount as a "battle for the Al-Aqsa Mosque and Jerusalem." When Israel ultimately removed its metal detectors and cameras, it was portrayed by Palestinians as a "victory," yet the PA warned it was only one of more "rounds of battle." Palestinian Media Watch has shown that PA and Fatah leaders are fond of the imagery of "watering Palestine with blood," and at times almost worship the "blood of Martyrs" who have "died for Palestine," as was the case during the wave of Palestinian terror attacks in 2015-2016. 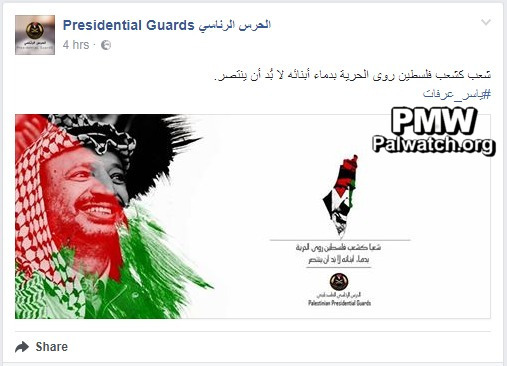 The image posted with the PA Presidential Guards' endorsement of "watering with blood" shows a picture of Yasser Arafat overlaid with the colors of the Palestinian flag together with the PA map of "Palestine" that presents all of Israel as "Palestine" together with the PA areas, painted in the colors of the Palestinian flag. This designates Palestinian sovereignty over the entire area. As PMW has documented, the denial of Israel's right to exist is a consistent message of the PA.